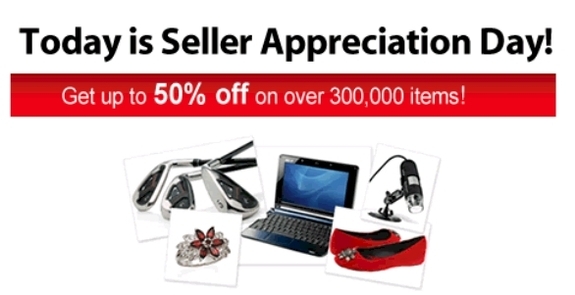 Vendable » Blog Archive » Today is Vendio Seller Appreciation Day !! Today is Vendio Seller Appreciation Day !! Today, for 24 hours only, Vendio and Alibaba are having a Seller Appreciation Day where you get access to incredible sourcing specials through AliExpress (see the Vendio Sourcing tab!). Over 300,000 products have been discounted up to 50% off their already wholesale prices! Vendio Sellers will also receive an exclusive 10% rebate in addition to these discounted prices! Time is limited, and these exclusive offers will expire at the end of the day! Take a few minutes to stock up for your holiday sales or for your future selling opportunities. As always, we appreciate you letting us help you sell more and more profitably online. This entry was posted on Thursday, November 18th, 2010 at 10:04 am	and is filed under Vendio Events. You can follow any responses to this entry through the RSS 2.0 feed. Both comments and pings are currently closed.